Look who has hatched, just in time for Halloween! Dragons aren’t always big and scary and breathing fire and flying around causing all sorts of trouble. Sometimes, they’re little and sweet and so very cuddly from the moment they bust out of the egg. Dragons like this don’t roar ferociously, they giggle. These aren’t the dragons that brave knights go out hunting. They’re the kind that won’t put damsels in any kind of distress at all whey they see them – they’ll just be totally delighted. Do you have a fiery little one in your life? Dress up your toddler in this Darling Dragon Costume, and just watch as all the lords and ladies in the kingdom are charmed into filling up that trick or treat pail to the brim this Halloween. The costume is fierce – fiercely cute, that is! The soft claws are good for clapping, the pointy little wings are just learning to fly, the face has baby teeth for big smiles, and the stuffed tail is so much fun to swing around. And the dragon scales? They are just painted on to look pretty. Running around as a Darling Dragon will be safe and easy, because the feet of the costume have padded, anti-skid soles and elastic at the ankles. The entire jumpsuit stays in place with Velcro dots and inseam snaps. A soft little dragon snout and big dragon eyes are sculpted on the lined hood, which stays on with Velcro under the chin. 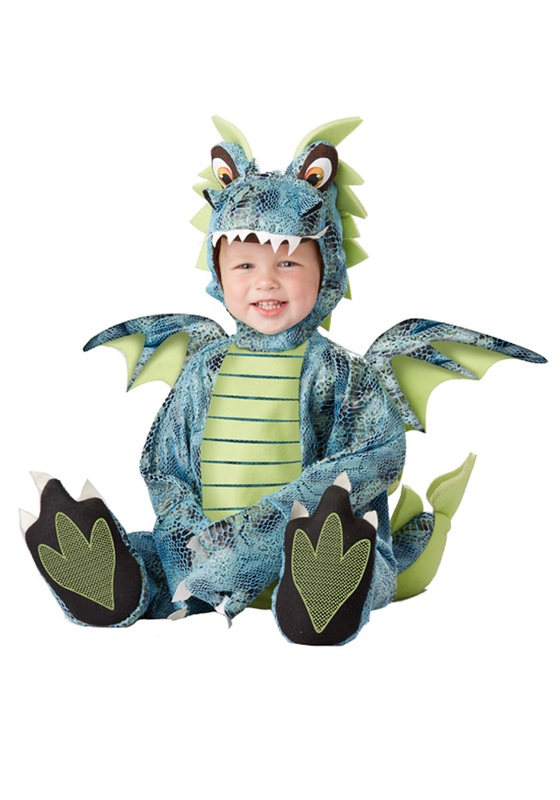 And the polyester brushed knit flannel costume is warm and cozy for taking your little dragon out on Halloween.